The plastic injection moulding process is a fast and precise way of producing hundreds or thousands of uniform plastic products. The basic process is self-explanatory; softened plastic is injected into a mould where it quickly hardens and ejects before the process repeats. When you drill down more closely into the process, however, it can be a lot more complicated than that, especially where the latest technology is concerned. Injection moulding is used to make lots of everyday plastic products. Packaging, toys, tool housings, telephones, bottle caps, plastic chairs, washing-up bowls, wheelie bins, DVD cases and lots of other items that you use every day are manufactured in an injection moulding machine. Wheatley Plastics is a well accomplished company when it comes to injection moulding. With decades of experience and a large stock of machinery, we can produce large and small products in a huge range of quantities. The process starts long before in the design and development stage. As part of this stage you need to create a mould and choose a suitable material for your finished product. The Wheatley Plastics team has extensive knowledge of thermoplastics, from the everyday varieties to some of the high specification engineering polymers. 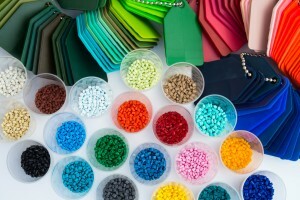 Once you have chosen a plastic, we will source it in pellet form. We will mix it with plastic coloured pellets and (for some projects) small amounts of recycled material. This mixture is added to a hopper at the head of the machine. Its then fed into a heated barrel which houses a long reciprocating screw. This screw gradually pushes plastic along the chamber as it heats up. It helps ensure that heat in the barrel is dissipated evenly and that the plastic granules are uniformly softened before they are injected into the mould. When its sufficiently softened, the plastic material is forcefully injected into a closed mould that is shaped to house the product. These moulds will usually be custom made for the client. At Wheatley Plastics, we have tool makers that can make these moulds for you. Once injected the mould opens, and air rushes into the cavity, breaking the vacuum and quickly shrinking the plastic product to hold it together. With the plastic product now fused onto one side of the mould it needs to be pushed off. This is done with special ejector pins that physically push the plastic off the mould wall. If you look at a nearby plastic product you should be able to see one or multiple small circular plastic marks. These are formed by the ejector pins and are known as witness marks. Large plastic products will have several of these plastic pins and small ones might only have one. But for really small products like plastic cutlery or small plastic parts you might be able to identify some different marks. Plastic materials that are very small are often moulded in large groups that are joined together by a plastic frame. Plastic knives, for example, might be manufactured in groups of eight or ten and then broken apart afterwards. Similarly, anyone who has ever completed an Airfix model (or bought an Airfix model and failed to complete it) will know that the parts come in large groups connected by runners that need to be snapped off individually. Plastic injection moulding makes plastic product production quicker and more efficient. It is therefore perfect for manufacturing large volumes of uniform products and does it with a high degree of accuracy. Some of the initial costs associated with plastic injection moulding, like tooling the mould, can be high. But it becomes very cost efficient when manufacturing high volumes of goods. Plastic injection moulding can be used to make basic and complicated products, and the process barely changes between the two. Wheatley Plastics has several plastic injection moulding machines in different sizes that gives us the capability to produce both small and large plastic products. For the largest plastic products, we use a 600 tonne Borche injection moulding machine. Smaller products can be manufactured in our BOY injection moulding machines. And because we have incremental sizes all the way down it means that we can produce injection moulded products in lots of different sizes.